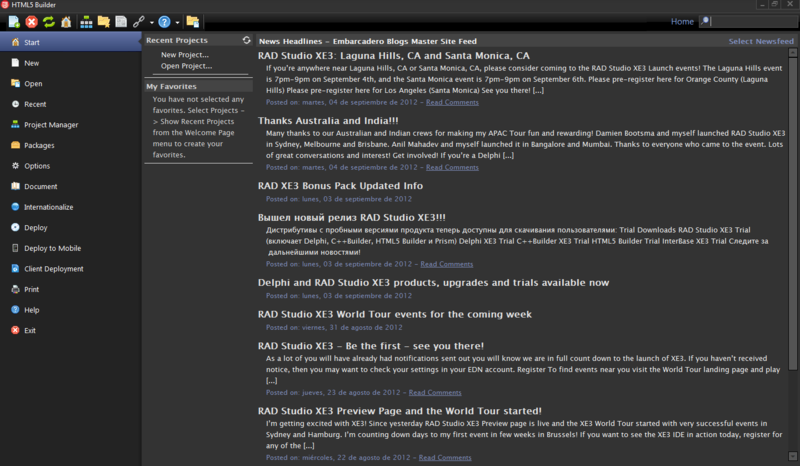 This is the first article about RAD Studio XE4 IDE. On this serie I will focus exclusively on what has been added on this release, from the requirements standpoint. I’m not going to focus exclusively on iOS, but on any addition/change that has been made to the IDE. 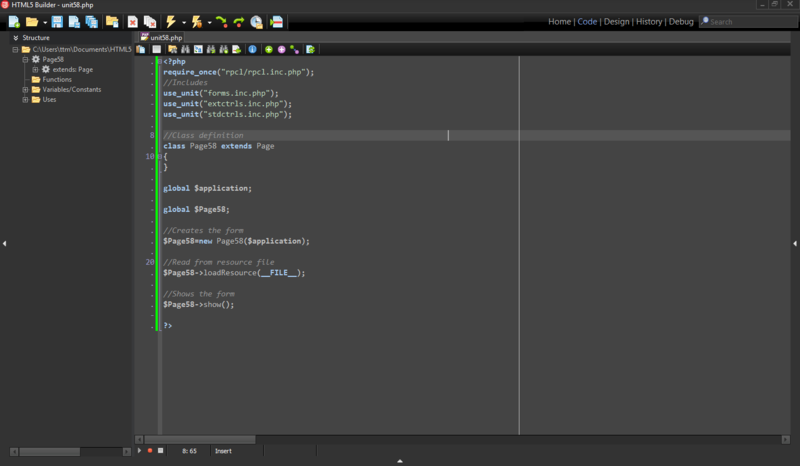 So, if you want to know every single detail on what’s new on the IDE, stay tunned!! On the following video I’m going to explain how the new Start Here section on the Welcome Page works. The Welcome Page is the very first thing you see when you open the IDE, and now, the default section is the Start Here section. A nice introduction page to everything you need to get setup and running quickly. 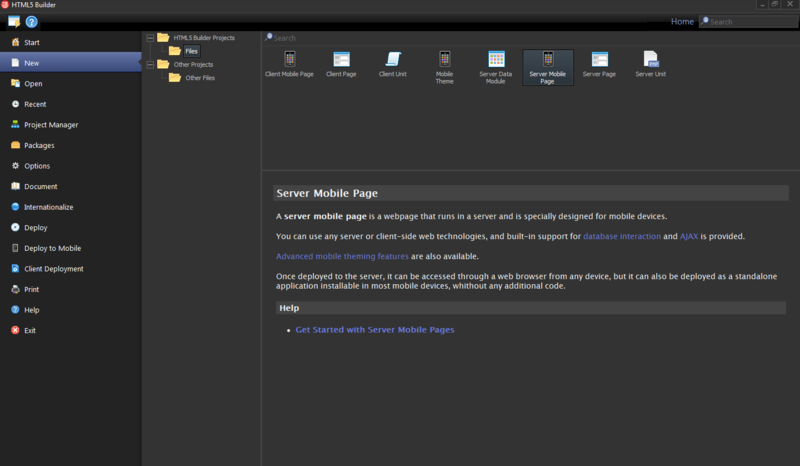 One of the new features of HTML5 Builder, is named Client Pages. You have two types of Client Pages, one for web applications, and another one, for mobile applications. Let’s focus on the Client Page, as the Client Mobile Page is very similar. Switch to the HTML5 Builder Projects category and create a new Client Web Application, you will get a new project created with a Client Page. And finally, on the context switcher, you get a new context, called Template. 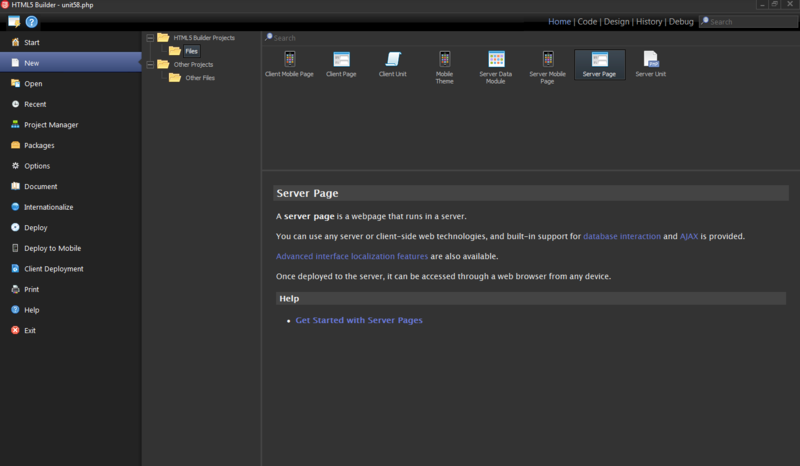 Apart from that, the module looks very similar to a Server Page. So when the button is clicked, it will show an alert message with that string. You get the Button you placed, where you placed it, and if you click on it and you will get the alert message. 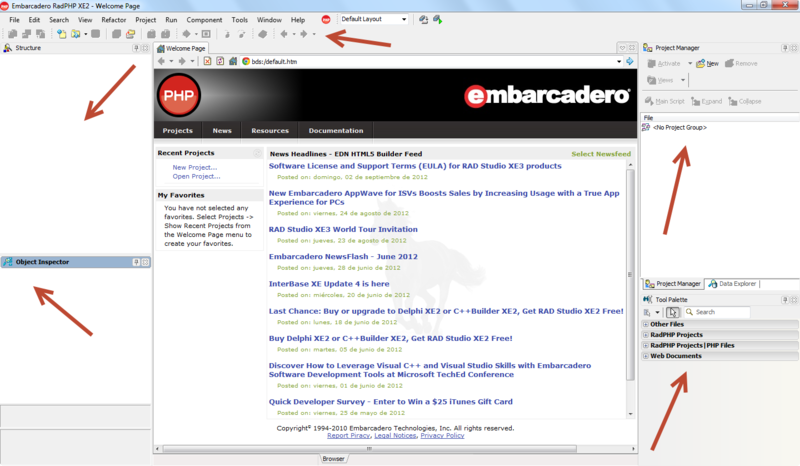 As you can see, no PHP code is shown anywhere, but the URL contains a .php extension instead the .js of your module. What is being done behind the scenes, is to make PHP to generate all the client code you need, you don’t need to deploy any PHP code to your server, I will explain this below, regarding deployment of client pages. The left pane is where you can place the contents of your template, that is, the HTML code to make up the layout of your page. If it’s empty, means no template should be used at all. Let’s just click on Import default template, and you get an empty HTML5 document, and the right preview pane, now it’s cleared, as it reflects the result of applying the template to your page. Now it’s time for you to place into the template, wherever you want, the tags that will be used to place your dynamic components. Place the cursor inside the <body> tag, and press Ctrl+Space. When the drop down list is shown, begin typing “Button1”, and the list will be filtered. Select the item “component Button1” and press enter. And now, the preview will be refreshed, showing your button on the top left of the browser, as there is no layout. That tag is built by the h5b qualifier, the name of the component class, and the name of the component as the id attribute. This way, you can generate a complex HTML5 template, and place the h5b tags wherever you want the components to be placed. To deploy a client page module, use the Client Deployment option, found on the Home context, this is a very simple wizard that will ask you for a folder where to put the generated files. As you can see, everything is client technology you can leverage anywhere, no need for PHP or any other server technology. 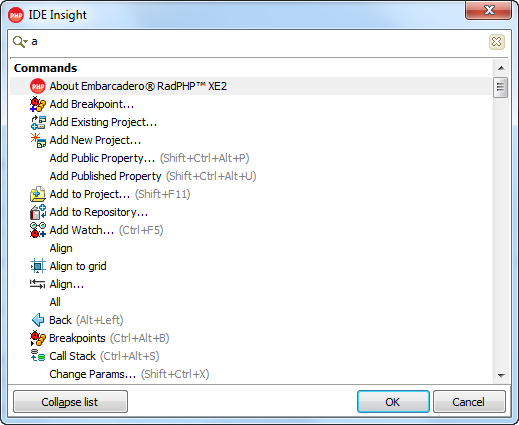 On previous releases, the IDE Insight was a modal dialog, which could be accessed by pressing F6 or Ctrl+. 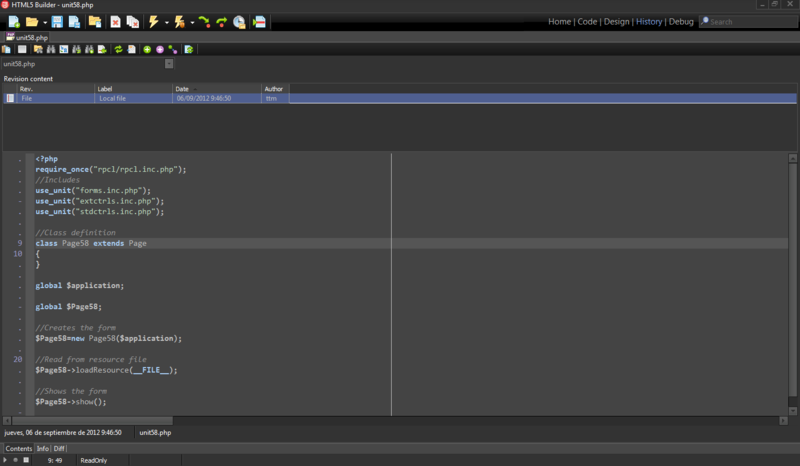 and provided a way to access all commands in the IDE. One of the biggest changes on HTML5 Builder respect to previous RadPHP versions, it’s the inclusion of the “contexts” concept. What we have tried with this concept it’s to allow the user to focus on what is doing and remove tools that actually are not needed. If you are writing code, you just need to see the structure of your code and nothing else. When you are designing the UI for your application, you don’t need to see the project structure at all times. That is what “contexts” are about, it allows you focus on the task you are doing by modifying the IDE to offer just the tools you need. You are writing code, but there are several tools shown that are totally useless at that moment, you don’t need the Object Inspector for anything, nor the Tool Palette, nor the Project Manager. Wouldn’t be great to have all that space available for writing code? This is what we have tried to fix on HTML5 Builder. This is the default context, it’s always available, and shows global options. In this context you can access the Project Manager, Packages, all the wizards for deployment, internationalization, documentation, etc, and the help. When you switch to this context, the IDE hides the tools that are not needed, like Object Inspector, Tool Palette, Database Explorer, etc, and shows only the Structure, and the code editor, giving you all the space you need to write code comfortably. 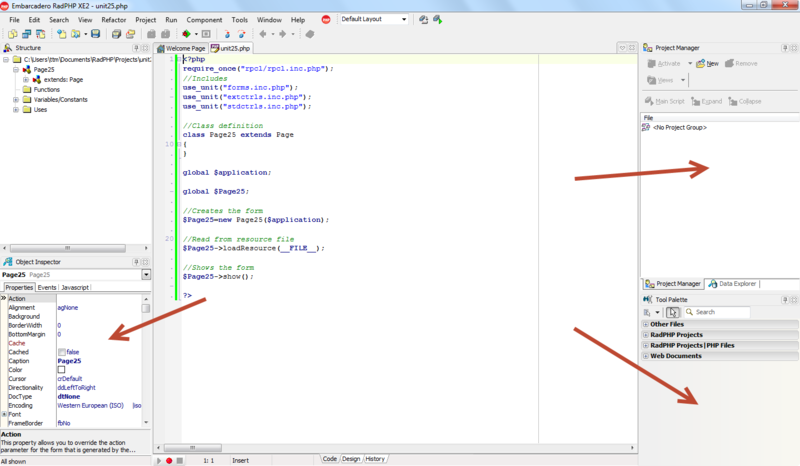 If you check at the right and at the bottom of the screen, you will see some arrows, that means there are another tool available there, but are secondary tools which are not actually required to write code. You can click on the arrows and expand them. 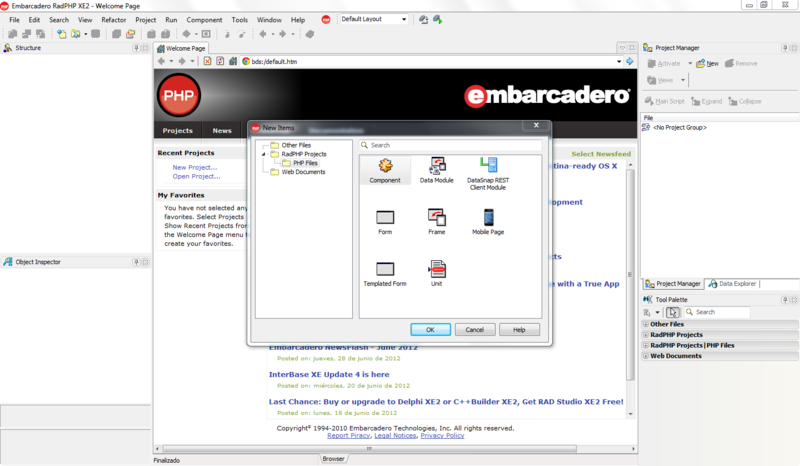 You will get the Templates window, and at the bottom, several tools like Breakpoints, Messages, etc. 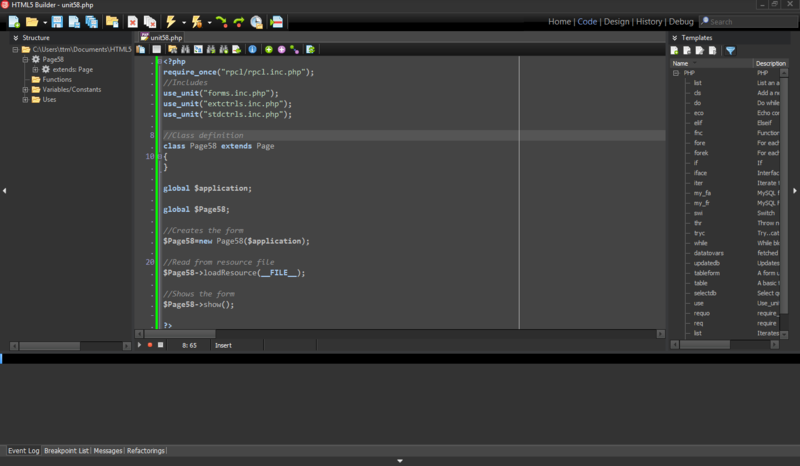 On this context, the IDE shows the design tools, like Structure, Object Inspector, Tool Palette and Data Explorer. Just remark that we have even hidden the status bar that was available in Code context, so you get more space for the design. This context provides the tools you need to rollback to a previous version of the file or to compare different versions so you can keep track of your changes. Switching to this context, makes the IDE show the tools you will be interested when debugging, like Watches, Locals, Globals, Call Stack, Evaluate/Modify, etc. Pay attention to the secondary toolbar you get on top of the content you are editing, is smaller than the top toolbar and contain tools specific to the content you are editing. Also that toolbar shows only the options available depending on what can be done, for example, you cannot copy some text if you don’t have something selected, so that option is not shown. As you can see, the IDE shows the right tools, at the right time, preventing you from having to reorganize the tools to be comfortable when working on your application. Another goal was to remove as much modal dialogs as possible. Modal dialogs is an ugly way to request information to users, where users are blocked until they provide a response to the software. It’s a vestige of old terminal apps and the less the application have, the better. There are still some in the IDE, but be sure we will try to remove them when possible. So, following with the UI articles, lets check how we have modified the Repository, the central location from which you can create all types of modules the IDE provides support to. If you want to execute an item, you can double click it, or just use the toolbar, the most top left option, which executes the item. To get help, use the help icon on the toolbar. As you can see, only the options that you actually need depending on what you are doing are visible, removing the clutter from the workspace. 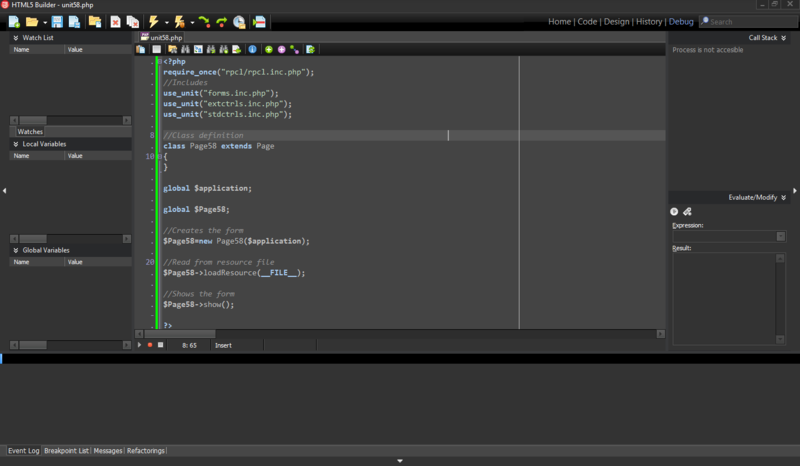 If you are a RadPHP XE2 customer, the first thing you will notice when running the IDE for the first time, is the new UI. The new UI breaks the link between RAD Studio and RadPHP, that is, in the past, both products had to look and behave the same, but this is not that way anymore. So we have taken that opportunity and we have come up with a brand new UI, specially suited for this tool. Probably, some concepts won’t work for another tools, not even for RAD Studio, but that was not the goal. All this is wasted screen real state, and the Tool Palette showing the repository items is a “solution” in order to show something there when the content area is not showing the Form Designer. How many times have you used the Tool Palette to create a new form? No tools that are not needed at that context are shown. We have just open the tool and there is any project open, there is no need for Object Inspector, Structure, Tool Palette, etc. You have on the left the global options you can use, you will see more about this when I explain more about contexts in another ports. 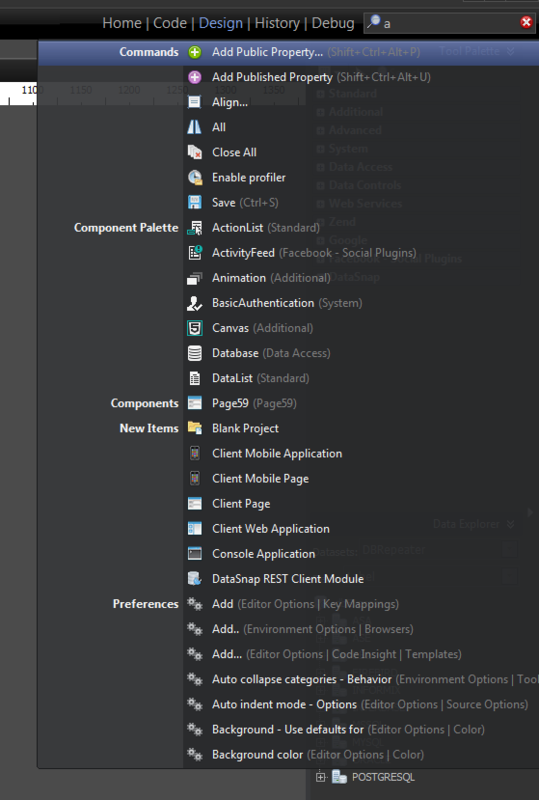 On the other hand, the icons are bigger, we are using PNG with transparency, and the color scheme is dark, following the trend other tools like Photoshop or Visual Studio 2012. I will explain more about the dark style in another post. I hope this article helps you understand the whys and hows of the new UI, and please, don’t hesitate to post your comments. HTML5 Builder UI is not tied anymore to RAD Studio UI, so it’s going to be easier to implement changes you request. 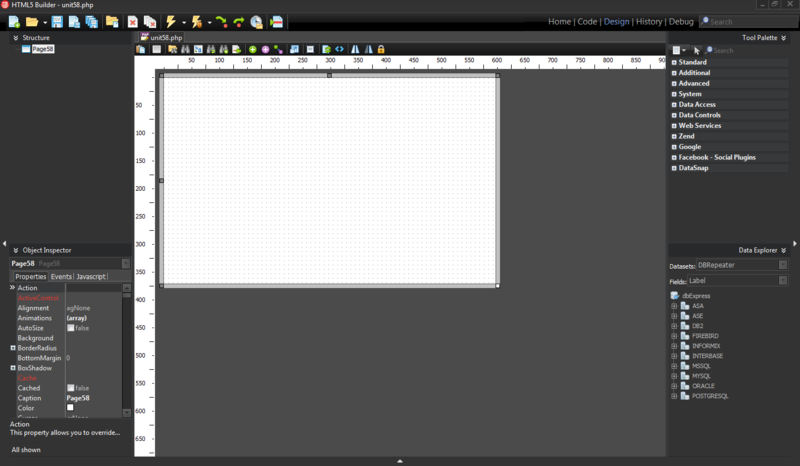 This is my first post about HTML5 Builder, the “new”product included in RAD Studio XE3. I’m quoting it as “new”, because is not actually a new product in itself, but the next version of RadPHP, with a huge amount of changes. The scope and the goals of HTML5 Builder suppose a drastic change over RadPHP XE2, so the name change was something that needed to be done. I’m getting lost with so many product name changes!!! 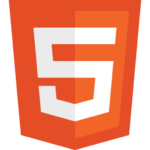 Why HTML5 Builder? No more PHP in the product? Yes, but now the product is not fully focused on PHP, now PHP is a subset of what the product can do. A lot of work on this release has been spent on providing a lot of “client” capabilities, targeted even to customers which doesn’t know anything about PHP and just want to get the HTML/CSS/JS, but get the benefits of a visual designer and a component library. What is all that client stuff about? So, if it’s the next release of RadPHP, will my previous RadPHP applications work, isn’t it? I have downloaded the demo, and there is a lot of controls that have been dropped!!! Yes, and others have been added. We have dropped qooxdoo and several other controls that were causing some incompatibilities. If you use an (excellent) framework like qooxdoo, you cannot mix it easily with other frameworks like jQuery. Also, including a lot of controls, required a lot of maintenance work, a work which was impossible to do to provide the quality we were aiming in this release. On the other hand, we have added a lot of HTML5 controls and you can find replacements for trackbars, progressbars, spinedits, etc, that now use the HTML5 widget instead qooxdoo ones. The new UI is too different of what I’m used to, I don’t like it at all!! When you are used to a UI, a dramatic change like this one will require some time to get used to it, in fact, the same happened to us, but after some weeks using it, we are sure you will see the previous UI outdated as we see it now. In any case, I’m going to prepare a series of articles regarding the new UI to let you know the why’s and how’s of the change, stay tunned!! As this is the first post, I just want to give a small introduction to the product, I will provide more articles in the coming days, please, feel free to send comments about it!